During my wedding journey, I was so excited to start making my wedding invites. I was assuming that I would order some invites like most people do. But then on Christmas, my fiance bought me a cricut. If you don’t know what that is, it is a crafters dream tool. So after I got that, my fiance thought I should start making the invites, so I did. I found a cute template and I thought it would be cheap to do since all I needed was paper. Oh how I was so wrong about that. For one, I had to get the right paper and that wasn’t cheap, then I had to buy shimmery paper for the actual invite, and then I decided to gold foil the invites to add an extra flair to it. That took even more time. Then I had to find just the right ribbon for the invite. This was such a long process that I barely finished making the invites literally tonight. It also didn’t help that I had to make an extra 3o invitations for my parents friends that I don’t even know. For some reason my parents feel the need to invite everyone they know even if they don’t even know who I am. I personally feel like it’s just pointless because it is my special day and the people that go should only be the people that care about my fiance and i. Has anyone gone through this issue of having to invite people that you don’t want ?? Apparently to them, they don’t want people to talk badly about them for not inviting them even though these people barely talk to them, unless they see them at the store or something. Sounds pretty ridiculous right?? This issue has just caused me so much stress and it’s literally annoying. It kind of made me want to elope even more. If only we didn’t put down deposits for everything. I don’t know a picture of my invite on here, but I will be sure to post on here later. If anyone would like tips on how to make an invite then just please let me know. Every girl dreams of their perfect wedding and how planning it will be so much fun. Well unless you have tons and tons of money, then that is definitely not the case. I’ve been engaged for about 2 years now to my high school sweet heart. We’ve know each other for about 10 years now, so its about time we get hitched. Before I was engaged I thought that planning a wedding would be so easy and that I would be so organized for it. Well its some what true, I was very organized throughout the entire process. I am about 3 months away from the big day. I wanted to blog about the entire process, but my time has been so limited that I wasn’t able to. So now I want to document everything I can so hopefully the girls that read this will take my advice and do better. Each day I will try to blog about different parts of a wedding, but the most important part is to know what you want in your wedding. Also, make sure that if you do really want your dream wedding, then to have enough money saved up for it. Every time we meet with a wedding vendor, they always ask what your budget is, but it seems like its so hard to have a budget because even if you tell them what your budget is, they might not even be able to do it, so you have to come up with the money anyways. If anyone has any questions about this process, then please feel free to ask. I would love to talk about weddings with other and maybe someone could give me some tips as well. I’ll end it here for now, but tomorrow I will talk about wedding invitations and that whole process. So I wanted to share something with all of you that I had recently purchased. Its this mineral veil from Bare Minerals. The packaging was too cute not to share with all of you. This is limited edition for the holidays. They have this packaging for the mineral veil, which cost $36. Its a little bit more pricier than the normal mineral veil, but this one is a lot larger and could potentially last you a life time. They also have this packaging for the normal powder makeup, and the only thing that is different is that instead of the clear jewel in the middle, they have a red jewel. So recently, I have changed up my makeup routine to where I am not wearing liquid foundation anymore. Liquid foundation tends to wear off on my really quick and it doesn’t give me the coverage I need. So I have been using Bare Minerals Complexion Rescue, which is a tint hydrating cream and it gives my face the color it needs. And then I top it off with the Bare Minerals READY Foundation Broad Spectrum, which covers so amazing. This had been my foundation routine since the summer because I live in Utah and the heat here can get pretty crazy and the liquid foundation was just melting off of me. These two products have definitely been a life saver. For a while, I was just using these two product alone, but then a while back I found that I had some mineral veil left and it just made my makeup even better! It helped my face not be so oily, which is a huge problem for me. So this jumbo mineral veil was a bit of a splurge for me, but luckily I got it for pretty cheap. Recently, I tried this new app called Raise and it allows you to buy gift cards for cheap because people don’t have a need for them anymore so I was lucky enough to get a Sephora gift card for cheap. If you use the code “kphan1”, you will get $5 off your purchase. Also if you use the code “Raise10”, you can save another $10 off a gift card. Like how awesome is that? Also, make sure you check out eBates.com, this site really does help you save money when your shopping online especially for purchases like this. When I purchase makeup items from Sephora, I tend to like shopping online better than actually in-store because you not only get cash back for it, but with you purchase you can get little kits of free samples, where they won’t give you in-store, which is a bummer to me, because I love free samples. So with my purchase I also got a little makeup bag full of samples that I can’t wait to try. If you want to learn more about my money saving tips or how I get free gift cards, then please let me a comment below so I can do a post on thank. Thanks for reading, and I hope everyone had a wonderful Thanksgiving! Are you on a diet or trying to eat healthy? Well I don’t know about you, but I am. If you have been following my blog for a while you know that I don’t post very much, but the posts that I have made have been on the topics of diet, exercise, and health. In the Spring I was doing Graduate school and we all know that school is very stressful making it very difficult to eat healthy. Most of the time I just eat whatever I could get my hands on. From that I gained so much weight. About 10-15 pounds actually. This is probably the heaviest I have ever been. Well since the semester is over I am doing all that I can to lose those unwanted pounds. I work out like crazy, but the hardest part is trying to eat better. My boyfriend and I are always on the go, so its easy to always get fast food, but I have been trying my hardest to cut that out. Also I have been trying to cut out unhealthy snacks like chips, soda, and candy. It has been so hard to cut that out of my life, but luckily I found Nature Box. 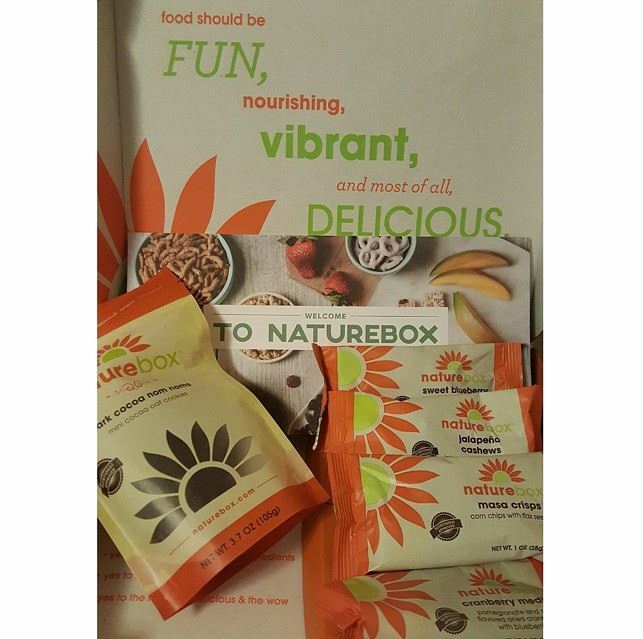 Nature box contains snacks that are good for you, but on the plus side, they’re healthy. With Nature Box, they allow you try it before you actually commit to buying it. The first sample box they give you is free, but you do have to pay $2 shipping on it. It comes with 4 sample size snacks and 1 full size snack. So far what I have tried has been delicious. The only thing I didn’t like was the jalapeno cashews because I just don’t like the flavor of jalapeno at all. The other snacks I got were dark chocolate oat nom nom, which is like a no bake cookie. Blueberry almonds, which have been my favorite and it also came with masa crisps and cranberry medley. The cranberry medley is essentially like the cranberry version of raisins. I have been really happy with this box and I can’t wait til I get my actual full size box with the snacks that I want. Especially the gummy candy. The full size box is also a good price. You get 5 full size snacks for $19.95, which is a good deal because when I try to buy organic snacks at the grocery store they come up to around that price as well. Overall, I would recommend trying the sample box. I mean it is only $2 for a box full of snacks, and that’s a deal that’s hard to pass up. If you have any questions on the snacks or would like me to do a review on my next box then please leave a comment below. Thanks for reading. First of all, being on a diet is difficult in the first place, but being Asian makes it even more difficult. Literally every meal you have consists of carbs. Weather its white rice or some sort of noodle dish. It is so hard to get rid of rice and noodles in your every day meal especially when you have grown up with it your entire life. I mean can you say no to a bowl of Pho??? Ya I don’t think so. I can literally exercise as much as I want, but I will still have white rice haunting over me. LOL. Recently, what I have discovered to be amazing is quinoa. If non of you know what quinoa is, it is a grain that has a similar texture to rice, but is better for you. So what I started doing was replacing white rice in all of my meals with quinoa. I am not too sure if this will help me in my weight loss goal, but it is sure worth the effort. Why do carbs have to be soo good. Now I just have to learn how to cut out all of the junk food like Pizza, cake, ice cream and soda, which shouldn’t be too hard but sometimes you just have those urges. Have you ever felt the thirst for a soda and then when you take a drink you feel that sweet goodness going down your chest? If you do let me know, so I know that I am not the only strange one. Well enough of me rambling. Thanks for reading. Sorry I haven’t had the chance to post anything lately, but I’m actually learning to try to balance everything in my life and hopefully that means more blogging. There are some recent updates in my life that I want you all to know. In December I finished my first semester of graduate school and I passed all of my classes!!! So I am very excited about that. But what is more exciting is that I got engaged on Christmas. It was a total surprise and I was so happy. 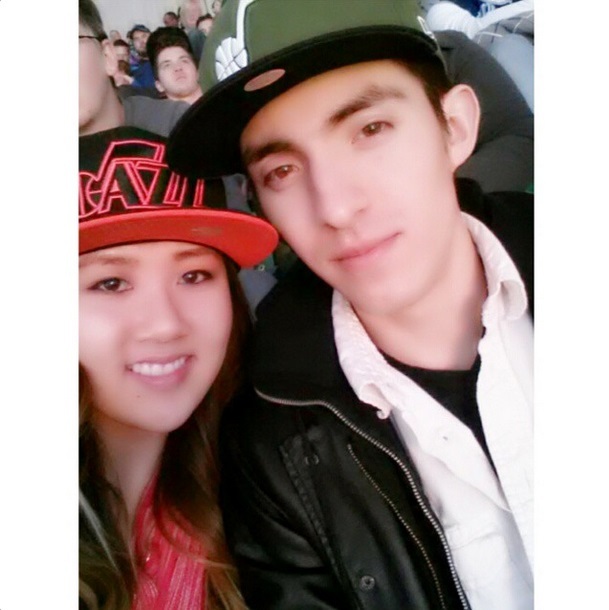 Me and my fiance have been together for 6 years and I am so happy that I get to spend the rest of my life with him. So slowly I am trying to get wedding ideas and what is more important is that I am trying to get in shape so that I can look amazing in a wedding dress. Yesterday I started my second semester of graduate school and while I am only taking 2 classes I am still very nervous about it. Yesterday I also started my own personal fitness challenge. I am trying to run 2 miles per day and I am also doing these blogilates challenges. One is a 30 day flat ab challenge and the other one is a beginner’s guide to Pilates. I want to try and stick to this as best as possible and hopefully I can see some results at the end of this challenge. I will keep you guys updated on my progress through all of this. Well I have to watch my second lecture. Hopefully you guys enjoy my post. Tonight I went to my very first Jazz Basketball game. I have lived in Utah my whole life and have never been to a game once. I normally don’t like watching sports, but it was a fun experience. Tonight the Jazz played the Indiana Pacers. The Jazz were down the whole time. Towards the end, the Jazz started to catch up and almost had the chance to go into overtime with a tie game. Unfortunately that didn’t happen, but it was still fun. For all you fashionistas out there I wasn’t quite sure what I would wear to a basketball game since I don’t have a Jazz jersey or a shirt. So the outfit I went with was a black tank with some blue skinny jeans and black booties. And to show my support for the Jazz, my cute pink snapback and of course you have to have a cute scarf to match with it. The fashion highlight of the night were these two cute old Asian ladies who were at the game and they were dressed in all pink Jazz stuff. It was so adorable. I wish I could have taken a picture to share it with you guys. Well i’m off to bed. Goodnight and Go Jazz!!! !